Happy Friday Everyone! Next week is Teacher Appreciation Week, and I've been scouring the web looking for something fun, unique and useful to sew. (That also won't break the bank-- my preschooler has 3 teachers!). I've rounded up 11 sweet projects that I'm sure I can wrap up this weekend. (My bad track record with the KCWC nonwithstanding.) Need more? Checkout the pinterest board I've started for more ideas! 1. This Pencil Case from Ikat bag caught my eye ages ago. The case is fully lined without exposed seams, and she has a clever way of putting in the zipper that I really want to to try. See the whole tutorial at Sew, Mama, Sew. 2. Of course the Cake Clutch-- this is especially affordable if you have multiple teachers you want to honor. 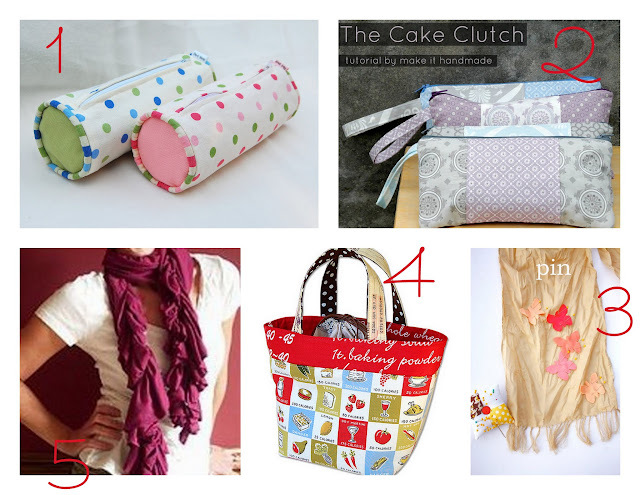 Check out the Cake Clutch Tutorial at the Bakeshop! 3. I love this simple Crinkle Scarf from Ruffles and Stuff. Looks light enough for summer wear, and an older child could help with the fringe. 4. Does your favorite teacher sack a lunch? Even if she doesn't, I'm sure she could find a use for this sturdy Lunch Bag from Ayumi at the Pink Penguin. 5. This jersey Scrunch Scarf from Fave Crafts looks as fun to make as it is to wear. 6. Christy from Is It Naptime Yet? came up with this sweet tea wallet. It looks so easy to make, and you know your teacher already has a few mugs hanging around. 8. Dana from MADE made these sweet (ha! pun intended!) oilcloth pouches to hold candy. Well, I'm sure they'd hold nearly anything, but candy would be best. 7. This Reversible Fabric Basket from the Red Kitchen starts out as a simple square, but ends up being a teacher's desk organizer, change tray, or secret in-the-drawer candy stash holder. 9. I'm a sucker for baskets and buckets, I'm guessing other people who hang out with little kids will be too. This happy little basket from Sew For Home is a great size for tucking onto a shelf. 10. If you are new to zippers, check out this lined pencil case. It's a straight forward, well written tutorial from The Dining Room Drawers. Phew!!! 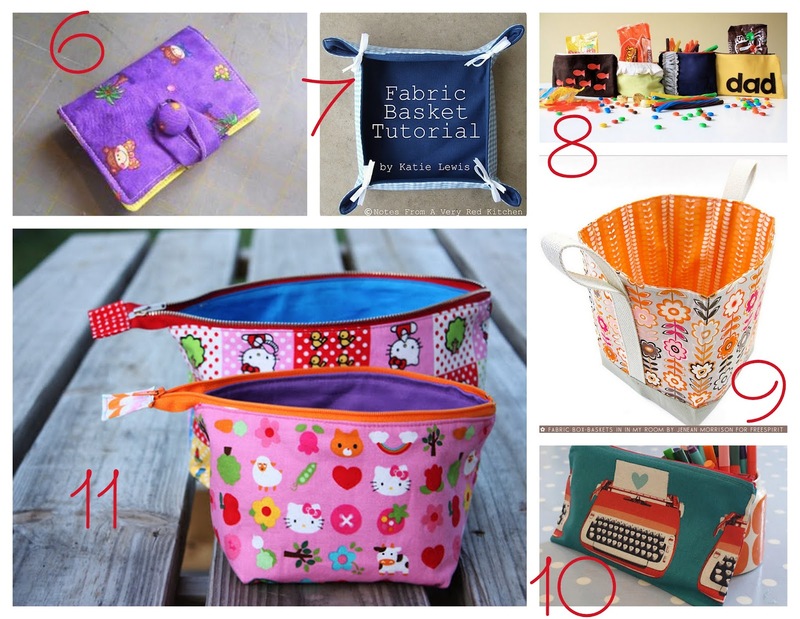 I hope you found something that you'll love to sew for that special teacher in your kid's life. If not, look here for more ideas-- I'll be updating the board throughout the weekend. This is my son's first year at school. We owe so much to the teachers that go the extra mile to make him feel at home and make us feel great about taking him to school. I'm so excited that they have a day just for them!